Detects Myosin VIIa/MYO7A from mouse tissues as well as recombinant. 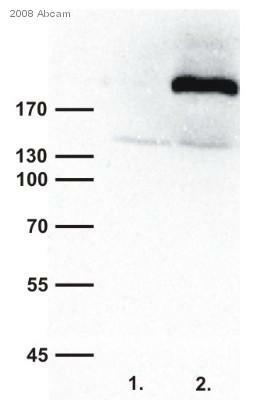 By Western blot, this antibody detects an ~220 kDa protein representing myosin VIIa/MYO7A from mouse testes preparations. This antibody detects recombinant mouse myosin VIIa/MYO7A overexpressed in Sf9 insect cell lysate. Synthetic peptide corresponding to Mouse Myosin VIIa/MYO7A aa 16-31. 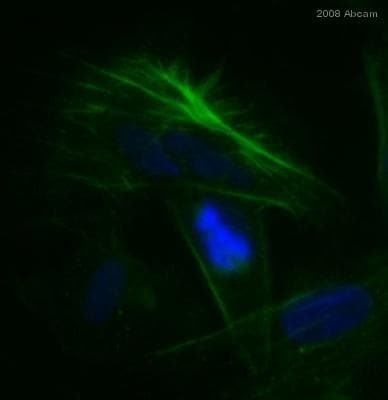 Myosin VIIa is a member of the myosin superfamily of actin-based motor proteins. 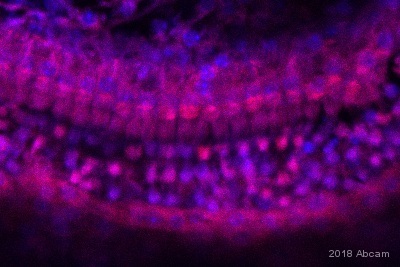 Defects in the myosin VIIa gene are responsible for hearing impairment in shaker-1 (sh1) mice and causes Usher syndrome IB in humans. Usher syndrome associates congenital deafness, vestibular dysfunction, and retinitis pigmentosa and is the most common form of combined deafness and blindness. Structural features of myosin VIIa protein include an ATP binding N-terminal motor domain, a central region which possess five light-chain binding (IQ) motifs, and a C-terminal domain with three myosin tail homology (MyTH4) and talin-like homology regions. Our Abpromise guarantee covers the use of ab3481 in the following tested applications. IHC-P 1/500. Perform enzymatic antigen retrieval before commencing with IHC staining protocol. WB Use a concentration of 5 µg/ml. Detects a band of approximately 220 kDa.Can be blocked with Myosin VIIa/MYO7A peptide (ab4996). Myosins are actin-based motor molecules with ATPase activity. Unconventional myosins serve in intracellular movements. Their highly divergent tails are presumed to bind to membranous compartments, which would be moved relative to actin filaments. In retina, myosin VIIa may play a role in trafficking of ribbon-synaptic vesicle complexes and renewal of the outer photoreceptors disks. In inner ear, it may maintain the rigidity of stereocilia during the dynamic movements of the bundle. 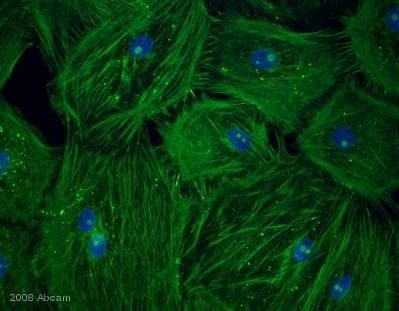 ab3481 staining primary cell culture of Pig retinal pigment epithelium by ICC/IF. Cells were PFA fixed and permeabilized in 0.5% Triton X-100 prior to blocking in 5% serum for 20 minutes at 25°C. The primary antibody was diluted 1/500 and incubated with the sample for 16 hours at 4°C. 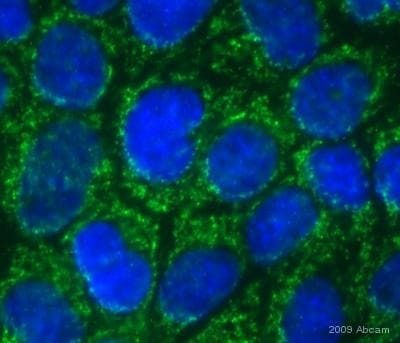 An Alexa Fluor® 148 conjugated goat anti-rabbit antibody, diluted 1/750, was used as the secondary. 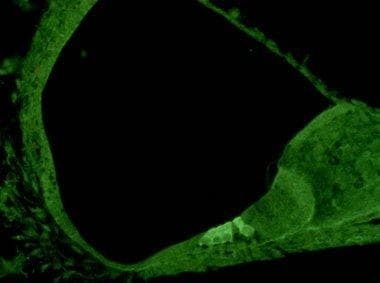 (G) Histochemical staining of mouse P5 cochlear sensory epithelia inner hair cells (IHC) and outer hair cells (OHC) with Alexa Fluor 488® phalloidin. 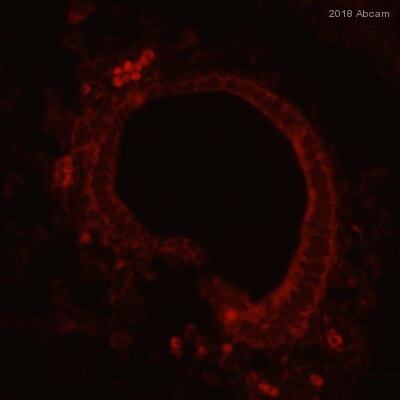 (H) Immunohistochemical staining of mouse P5 cochlear sensory epithelia with rabbit IgG as an isotype control and an Alexa Fluor 594®-conjugated goat anti-rabbit antibody as the secondary antibody (dilution 1/2500). The scale bars represent 8 μm. 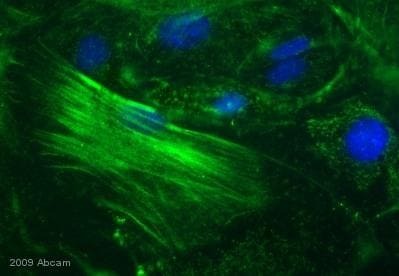 (A) Histochemical staining of mouse P5 cochlear sensory epithelia inner hair cells (IHC) and outer hair cells (OHC) with Alexa Fluor 488® phalloidin. (B) Immunohistochemical staining of mouse P5 cochlear sensory epithelia with ab3481 as the primary antibody (dilution 1/900) and an Alexa Fluor 594®-conjugated goat anti-rabbit antibody as the secondary antibody (dilution 1/2500). The scale bars represent 8 μm. ab3481 at a 1/500 dilution staining Myosin VIIa/MYO7A in Mouse retinal pigment epithelium primary cells by Immunocytochemistry/ Immunofluorescence, incubated for 16 hours at 4°C in 1% goat serum, 0.1% Triton X-100, 1X PBS. Fixed in formalin. Permeabilized using 0.5% Triton X-100. Blocked with 5% serum for 20 minutes at 25°C. 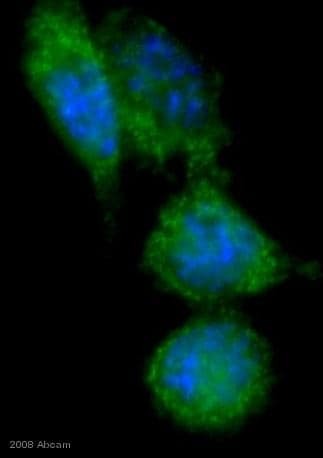 Secondary used at 1/500 polyclonal Goat anti-rabbit conjugated to Alexa Fluor 488. Western blot detection of Myosin VIIa/MYO7A in mouse testes tissue extract using ab3481. Publishing research using ab3481? Please let us know so that we can cite the reference in this datasheet. Thank you for your enquiry. There is no stated expiration date for this antibody. There is one year expiration date from the date of purchase, however the Abpromise will be still effective for only 120 days after purchase. This antibody is unlikely to be be discontinued as the sales for the last two years have been consistent. I hope this information helps. Please do not hesitate to contact us if you need any more advice or information.